The Agusta 109 is a twin engined, single pilot, IFR helicopter. It can carry up to 7 passengers and is the fastest civil helicopter available for charter. 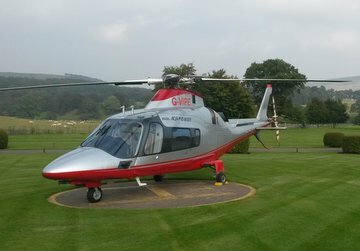 The 109 is a quick, comfortable and very capable helicopter and is the machine of choice for most VIP helicopter charters. There a two variants, the Power and the Grand. The 109 Power helicopter combines high performance with ease of maintenance, reliability and cost effectiveness. It is an extremely capable machine used extensively by emergency medical services, the police and the military. In its VIP, passenger transport configuration the rear cabin provides a fast, comfortable and quiet environment. This helicopter combines a fast cruise speed of 135 knots, excellent range and Category A performance, allowing it to land on small private landing sites. The 109 Grand and Grand New helicopters boast a slightly wider and longer cabin than the 109 Power. The cabin provides a little more leg and shoulder room and is one of the most luxurious available. Alongside the additional space the 109 Grand also cruises at a faster speed of 150 knots. The 109 Grand New is the next generation of the Grand platform, with a full digital glass cockpit and composite material fuselage. The new EFIS (electronic flight instrument system) and 4-axis autopilot provide the pilot with capabilities never before offered in a light twin engine helicopter.